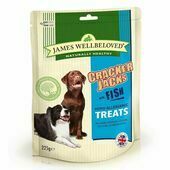 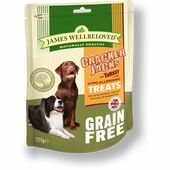 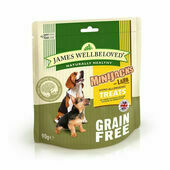 The perfect dog treats for pets with food allergies or sensitive digestive systems, James Wellbeloved Crackerjacks Lamb, Rice & Tomato are free from common food allergens such as beef, pork, wheat, soya, dairy, and eggs, and also contain no artificial additives that might cause dogs to become hyperactive. 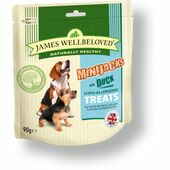 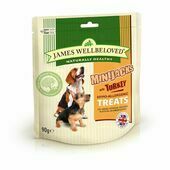 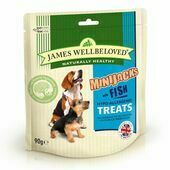 Foil wrapped inside resealable packets to help keep them fresher for longer, these hypoallergenic dog treats from James Wellbeloved are made using only the very finest British ingredients and use lamb as their sole source of protein. 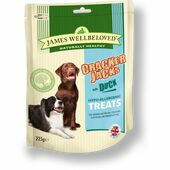 These James Wellbeloved Crackerjacks dog treat's lamb content has its flavour and nutritional value complemented by the inclusion of tomatoes, rice, parsley and thyme, which each bring their own benefits to the table. 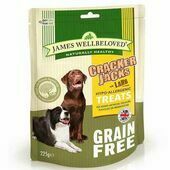 Perfect as rewards for training or for generally praising your pet, James Wellbeloved Crackerjacks Lamb, Rice & Tomato dog treats can be given to dogs without their owners having to worry about them having a negative effect on the dietary health or general wellbeing.